As we start to come upon the final 2 major phases of our renovation, the bar room and the front dining room, we decided to finish our bathrooms before we tackled those two major projects ahead of us. In going forward with renovations, one of the major issues that we wanted to tackle was going paperless (although toilet paper will never be replaced), we feel that there have been vast improvements. First is the Sloan Waterless Urinal. These urinals are exactly as they sound, urinal you don't have to flush. One urinal saves over 40,000+ gallons a year on water. Now that we have three of these and have been using the old style one for over 20 years, we are potentially saving 2,400,000 gallons of water in that same time span. For those of you that are curious, each urinal has a wax seal cartridge that is light than any fluids on the inside, meaning it creates and airtight seal to help wisk away and block any potential smells that may arise. But these urinals came at no easy task. Ray had to check with the Illinois Plumbing regulations to make sure that waterless urinals were even legal. There are now only 2 states that outlaw waterless urinals for use, and Illinois just removed the legal limitations in April of 2015. Much to the chagrin of all the plumbers who tried to talk us out of using them for the sake of ease and cleaning, we are now one of, if not the only commercial establishment in the state of Illinois with these urinals. 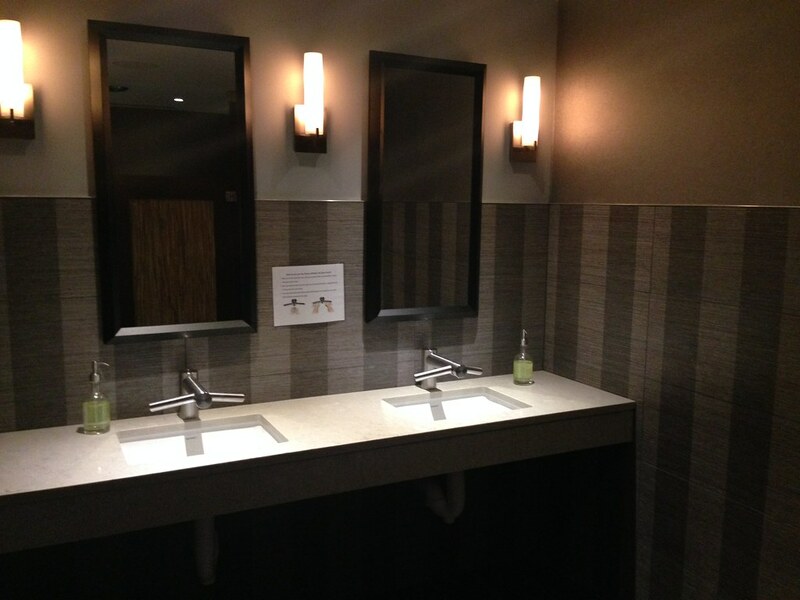 Our other feature is the Dyson hand-dryer faucet. You've used the hand dryers in many other places, but nothing like this. The hand dryer is built into the faucet. Much of the cleanup that is needed to be done in our restroom actually deals from the movement of the hands from the water faucet, to the paper towels, and then to the garbage cans. The water dripping eventually wears away at the tile and marble and leaves residue that everyone knows is extremely difficult to clean up without the proper chemicals. In turn these hand dryers eliminate all of that. Instead of having to walk half way across the restrooms after washing your hands, you only need to move your hands two inches to either side of the faucet, and the "air blades" kick on to dry your hands for you. It's sanitary, easier for cleanup and much more sophisticated looking that the older, generic faucets that used to be in our restrooms. For those of you who can not figure out the dyson hand dryer faucet, instructions are posted in the restroom for you. It seems simple, but not everyone can figure it out on their first try. Just ask our staff! The men's room took us all of a week to remodel. We did some of the work during the day and had a crew in pulling the late night shift for 3 full nights. Ray himself went a 24 hour period without any sleep! We are currently working on the women's restroom and hope to have that done in the next week (don't worry ladies, you'll have the same chance to use the hand dryer faucets as well). In the meantime we go unisex and everyone gets to use our newly remodeled mens room to check out some of our new features. We hope you admire the look as we approach the halfway point of this remodling endeavor!